It’s been a long and tedious road which the German state of Rhineland-Palatinate has been traveling since the 2016 planned sale of the Hahn Airport went very sour last year when it was discovered that the Chinese “buyer” turned out to be a fake. Since then the state government assisted by a new consultancy company have been searching for new bidders in the hope that the sales process could be restarted. After the disastrous sales process in 2016, the local government partly put the blame on KPMG, the consultancy company hired to research, find and coordinate the new owner. Both sides, KPMG and the Rhineland-Palatinate state government in Mainz, equally laid the blame at each other’s doors for the debacle. However, that all seems to be forgotten now. The airport was tendered out again late last year with the aim of finding and tying down a new and serious owner. Various companies tendered their documental interest and finally a list of three were chosen for the final round of determining a preferred bidder. Up until January 23rd there were still three candidates in the running. Henan American Machinery, which is a joint U.S.-Chinese consortium. MG Holdings, a company with its headquarters in Kazakhstan. Local bidder ADC along with the Chinese HNA Group. ADC/HNA were listed by Martin Jonas Senior Partner for the consultancy company Worth & Klein Grant Thornton, employed by the Mainz ministers, on January 23 as being the lucky bidder. Jonas went on record as saying that the aim is to have a signed contract in place by mid-February of this year. Whether this will be possible remains to be seen! Preferred bidder status does not mean that the contract is as good as in the pocket. There is a lot of work to be done before both sides can eventually agree on a firm contract. Then, if done, it has to be notified to the EU Commission. Siegfried Englert, who earlier was Economic Secretary to the Rhineland-Palatinate government and is shareholder in ADC, has been working very closely for some time now with the China-based HNA Group in order to try and put together a concept to take over and run the Hahn Airport in the future. The HNA Group are no strangers to airport handling and the aviation business in general. An important part of their portfolio is Hainan Airlines, China’s fourth largest airline which has ambitions to expand further. The HNA Group has been active in Europe during the past couple of years having acquired Swissport, one of the world’s largest airport ground handling entities as well as taking a shareholding in TAP Portugal and acquiring the airline caterer Gategroup Holding, formerly Gategourmet. But, the party is not yet over! Although the HNA Group has much experience in aviation matters, it won’t be an easy task to put together a viable plan to get the airport back on its feet. A data room will have to be opened in order that the preferred bidder can now look closely at the figures. 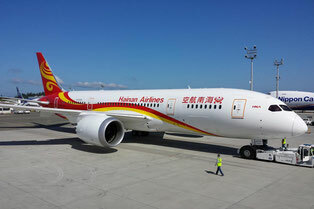 CargoForwarder Global was reliably informed that HNA is seriously looking at a new thrice weekly all freighter service into Hahn as well as three weekly long-haul passenger flights. Which carrier(s) are slotted to run these services is so far not being revealed. Also, it is stated that there will be an own tour operator service set up exclusively to market Hahn as an incoming and outgoing gateway. Cargo has to play an important role again in Hahn seeing that flight frequencies have suffered since Air China, Aeroflot Cargo, Yangtzte River Express and some others left the airport. The backbone of today’s cargo operation are the four weekly Nippon Cargo Airlines (NCA) flights along with some Etihad and Atlas Air Services. Silkway Airlines rotations have dropped to around three per week as the carrier concentrates also on its Milan gateway and is said have aspirations to operate out of Frankfurt’s Rhine Main Airport. Maybe a new owner status can keep them firmly in Hahn. There is a lot to be accomplished during the coming weeks before HNA-ADC can be assured that they are really onto a good thing. Best maybe to leave the politicians out of the final negotiations until the last minute and let the experts come up with a good plan to get this airport fully back on the map. The HNA Group certainly have the necessary experience to get the job done.